I WASN’T GOING TO POST ANYTHING today because I know many of you dislike Valentine’s Day with a red-hot passion that burns deep within your very souls. You, my gentle readers, mentioned this in the comment section of my post, Just Curious: Tell Me, What’s Your Least Favorite Holiday? From your comments I discerned, because I am a woman who can discern, that many people have issues with Valentine’s Day. Issues that remind me that I don’t want to step on anyone’s toes by being happy about this day. Nope, crazy lurks everywhere, causing issues until there’s medical intervention. Which are just like time spent with a therapist but more accessible and less expensive. Quote me, if you like. WHICH, OF COURSE, BRINGS ME TO the quote I’ve shared at the top of this post. It’s a quote from Tom Robbin’s novel, Even Cowgirls Get The Blues. I read this novel in college. I majored in English Literature, and this novel is an example of a subculture hippy novel, well-written, descriptive, not based in reality. So here’s the thing, the above quote is what I remember the most from the novel. As I recall the quote means that in life, love is what you use to fill the space so that there’s no emptiness. OR AT LEAST THAT’S WHAT I think it means, and considering how long ago I studied that novel, I want some credit for even remembering the quote… about love… on Valentine’s Day. And with that glimpse into my addled brain I’ll end this post. You may choose to believe that I’ve wished you a Happy Valentine’s Day OR if you hate this holiday you may choose to believe I have not wished you a Happy Valentine’s Day. As with most things, it’s all in how you look at it. Zen-Den was in [fill in the blank] for work and I decided to join him. In this case he was in Nashville, TN, aka Music City USA. So I flew down there for a goof-off weekend in a city that is cheerful and easy to navigate. Nashville is fun, y’all. Here are the highlights of our Weekend. :: We went to the Parthenon. Built for Tennessee’s 1897 Centennial Exposition, this building has INCREDIBLE detail, a small art museum in the basement featuring regional American landscape art, and is located in a large, somewhat uncared for, city park. I learned how little I know about Greek mythology while here, y’all. :: We went to a fancy part of town called Green Hills. There we wandered around a mall, and adjacent lifestyle center, that had many of the same stores that we have here, BUT they were twice as large with FRIENDLY sales help. As much as I don’t usually enjoy shopping, this I liked. I bought a Coach purse, y’all. :: We went to the Country Music Hall of Fame. This museum was amazing. FASCINATING. Curated to tell, entertain and engage everyone with music, videos, instruments, album covers, photographs, costumes, interactive displays and tasteful decor, we enjoyed this museum more than we thought that we would. I saw Elvis’s gold Cadillac, y’all. :: We ate at Ted’s Montana Grill. This is a chain restaurant, owned by Ted Turner, that features beef and buffalo, along with salads and fish and milkshakes. The restaurant was beautifully decorated in a 1970s steak-house style with lots of dark wood and shiny brass. The food was DELICIOUS and the service was attentive. I ate a bison burger– and I washed my hands with Boraxo powdered soap, y’all. :: And finally, the answer to the question that everyone asks when you go to Nashville: Yes, we went to the Grand Ole Opry. It was GREAT. We saw lots of older performers who we’d never heard of [Connie Smith? ], but eventually, as the evening progressed, we saw performers who we knew, like Vince Gill and Pure Prairie League. Then, in true Opry fashion, two superstars stopped by the Opry on a whim– and the crowd went crazy. I saw Tricia Yearwood AND her husband, Garth Brooks, perform together, y’all. • This comic strip has made my day. • Like Agnes, I can say anything with too many words, if need be. Got me through grad school. Not so useful in real life. • And like Agnes, I wanted a pair of cowgirl boots. [Yippie-Yi-Yo-Ki-Yay] But, alas and alack, it was not to be. I know that it is customary in the blogosphere to put a photo of yourself on your blog. As I understand it, the reasoning goes that by showing the world what you look like, more people will be interested in what you have to say. You will be legit. So, not wanting to seem standoffish or out-of-touch, I decided to look for a picture of me. This project seemed easy enough until I realized that I have very few photos of me. I think that I must have been Amish in another life because I don’t like to have my photo taken. Ever. 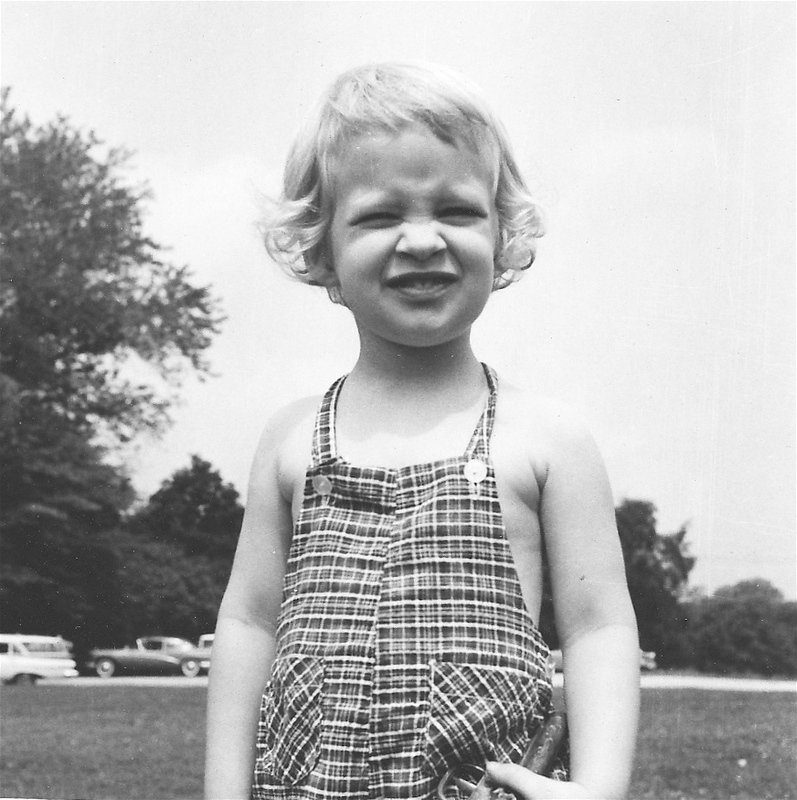 Still, I persevered and eventually I found this photo of me, age 3 (maybe 4?). I think that this photo is close enough to what I look like now to qualify as a current photo of me. I still squint when looking into the sun. I still have short blonde, sometimes curly, not quite straight hair. I still have a rather casual approach to everyday outfits. However, there are two important things about me that have changed since this photo was snapped. First, I wear glasses all the time. And second, I no longer carry a toy gun with me wherever I go. I cannot overemphasize this point enough. You see, this photo was taken during my “Wyatt Earp/Dale Evans” phase when I was convinced that if I dragged this gun around with me all the time, I’d eventually get my parents to buy me a cute little cowgirl outfit. My tactics failed. I never got the outfit and at some point a few months after this photo was taken, my little gun mysteriously got broken and was thrown out. While it’s true that I never achieved my cowgirl dreams, this photo of me and the toy gun remains today. And because of it I can show the world who I really am. Or was. And more importantly, I can show the world that I’m a serious blogger with a picture of myself clearly posted for everyone to see.